Exactly as he wore on the show, fit was as expected (snug - so need to be comfortable with that). Fit well (tight as expected) and looked the part for my Halloween costume. 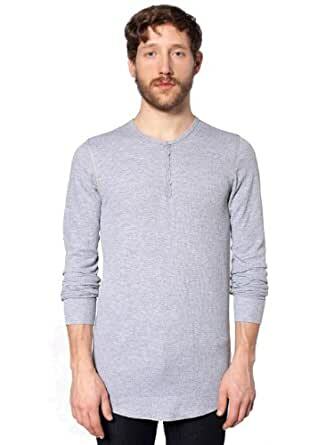 Great Henley, I own about 8 of these some in different colors, they are terrific and they last. A classic thermal Henley with crew neck, long sleeves and fitted silhouette. 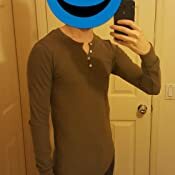 I've been searching for the best thermal henley over the years. 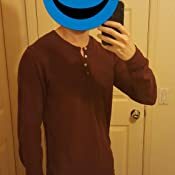 I'm 5'11, ~140 lbs, built like a swimmer. * Green medium - bought a few years back; pretty snug, but the body/sleeve lengths are good. In the end, I preferred a snug fit so I went with the medium. The shirts are thinner than a typical thermal. They run smaller based on the official specifications compared to their 2001 t-shirt; in other words, they are meant to be worn relatively snug which is why I found the large to have a rather long length relative to the chest size. After washing and drying with heat, these shirts will shrink maybe half a size down. I like the cuffed sleeves since if you push up your sleeves, they help to keep them from falling down. I am a 6' 4", 215 lbs athletically built guy and, generally, I order my shirts tall-size and in medium or occasionally large. I got this shirt in a size XL and it fits me surprisingly well. It is fitted and more built as an undershirt rather than as a standalone Henley. 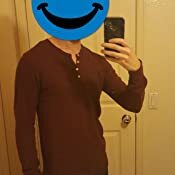 I have other thermal Henleys that I can wear perfectly fine by themselves as they are thick, whereas with this shirt, while it isn't skin tight it does show contours a little well than I would typically go with without an over shirt, and is made of a thinner fabric overall. Don't get it twisted though, it doesn't feel particularly cheap which I like. That said, it is long enough in the body as well as the sleeves which is just crazy to me considering that it isn't a tall-size shirt. Shorter guys be mindful of this, but if you're a tall fellow like me, the XL or XXL will actually fit. 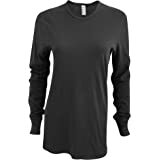 So I had purchased 6 of the baby thermals henley prior to the American Apparel folding. By far my favorite shirt loved them and wear them to death. So when I saw that this was available on amazon I thought it was a perfect opportunity to replenish my stock. These shirts are way different then the originals (the originals are displayed int he picture not the newer model). Different cut. Different button portion. I'm attempting to write this review without profanity. Here goes. I ordered this shirt as listed- - green thermal Henley. No printing. Just basic green. Pictured is what showed up. 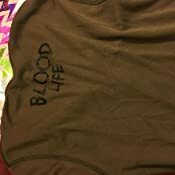 On the back is a screen-printed phrase in ghoulish lettering: "BLOOD LIFE." What the actual &$@! happened here? These shirts run two sizes bigger, which I knew tho so I purchased the right shirt. Amazing shirts! If I'm not mistaken these were worn by Dexter morgan, tho I don't see the darker green on here! but why they aren't re stocking these and making the dark green color is beyond me. This obviously sells well? I'm 5'10" and pretty damn skinny, the M works perfectly. Idk if it's just me but I thought the shirt was solid, but it has mini-vertical textured ribs. Still looks good, just didn't expect it. Bought this as a costume for my Dexter Halloween outfit. The fit is somewhat small compared (I got a medium which was very tight), but it is a PERFECT replica of the shirt Dexter wears. Comfortable as well. I LOVE AA thermal long sleeve henlys. I’m sad they don’t make them anymore so I was thrilled to see one here on Amazon. Only had red in my size but I was glad to have one instead of none.